Learn how to import your script and some best practices for screenplay formatting. Did you finish writing your script and now looking to import it into StudioBinder? Follow these instructions to get you started. Importing your script will make it convenient to access anytime and will give you the ability to tag elements, create shooting schedules, shot lists and storyboards. Note: Users on the Free plan will be able to import 50% of their script so they can demo the software. To import an entire screenplay, you must first subscribe to our Indie or Studio plan. On the Stripboard page, click Import Script. Drag and drop your script file (.fdx, .fountain or PDF) or click Browse to select a file. Tip: You can use WriterDuet to convert your screenplay to a .fdx file. Why did only half my script import? If only a few of the scenes in your script imported, this is because you're subscribed to the Free plan, which only allows you to import 50% of your screenplay. To import the whole script, you must be subscribed to a higher plan. What format can I import my screenplay in? You can import your screenplay if it's a PDF, .fdx, or .fountain file. There is no need to convert it to another format before importing to StudioBinder. Why does it only import 1 scene? If you are importing a multi-scene screenplay and it only imports 1 Scene, this is most likely caused by a formatting error. For example, if your Scene Heading is not marked as such in the scriptwriting platform that you're using, then it will not consider it a "Scene" when you import. In addition, we suggest importing a script that's in .fdx format since this contains the most amount of metadata and will ensure Scenes are broken up properly. Are the pages automatically divided into 8ths? Yes! 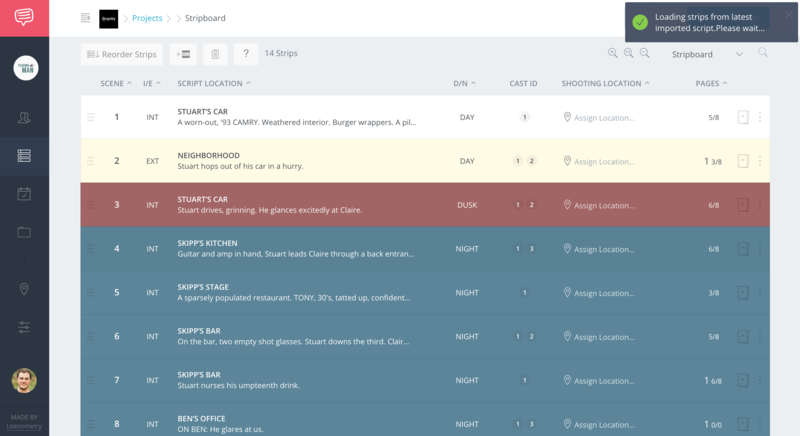 When you import a screenplay, we automatically create a Scene Strip based on the Scene Heading. If a screenplay has been properly formatted with Final Draft, you will immediately see the Page Count appear on the Scene Strip. What happens when I import a new version of my screenplay? When you import a new version of your script, a new version of your shooting schedule, shot list, breakdown, and storyboard will automatically be generated. Your work is not lost or deleted, in fact, you can roll back to a previous version of your stripboard if needed. Why are my scenes or page numbers not showing after I imported my script? Before you import your screenplay into StudioBinder, you should Generate scene numbers in Final Draft. This will help avoid having to edit each strip manually. In Final Draft, go to Production and select Scene Numbers. Select Remove numbers from the pop up box, and click OK.
Go to Production and select Scene Numbers again. Select the element you want to number and Click OK. Tip: If importing isn't instant, there may be script formatting that must be resolved prior to importing. Before importing your screenplay, we suggest making sure your formatting is correct in order to make the most of our software. If you've made changes to your Screenplay, and don't need to start from scratch, remember that you can always add a scene manually to avoid the need to redo work already completed. Are page lengths included when importing a .fountain file? Currently, this is not supported. You can also add new scenes manually to your Shooting schedule!